Almost every culture has traditions for mourning the loss of someone they love. In fact, burial grounds have given us some of the earliest insights into cultural traditions going back thousands of years. It seems that no matter who we are, or when and where we live, we all must come to terms with grieving the death of someone we love. As Christians, we mourn with hope in the knowledge that eternal life in Jesus Christ is our final destination. But if only it was that simple! Mary and Martha grieved at the loss of Lazarus (John 11:33) and we will also weep when someone we loves dies. 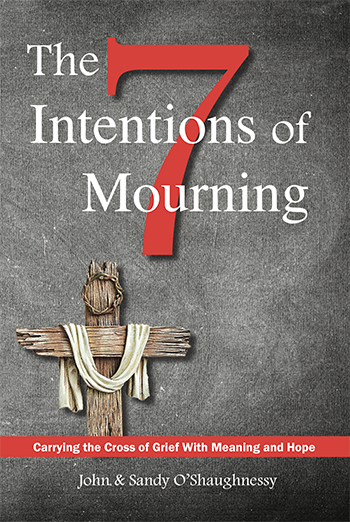 The 7 Intentions of Mourning: Carrying the Cross of Grief With Meaning and Hope is authored by John & Sandy O’Shaughnessy, founders of Good Mourning Ministry, a mission-driven healing ministry supporting Catholic parishes throughout the United States. This insightful and beautifully written book illustrates that when we unite our suffering with the suffering Christ, we learn that it can be redemptive and fruitful as part of His salvific mission. The seven intentions of mourning are each conscious choices, and together they present a unique pathway to healing where our grief finds a meaningful expression. Each intention is strategically positioned to help believers carry their personal cross of grief alongside the risen Lord as they discover that love endures all and that good can come from bad when there is hope. The pages of the book provide writing space to record prayerful, practical and personal intentions — a unique approach to building bridges toward a new and different life after the loss of a loved one making it ideal for parish bereavement groups, clergy formation, grief counselors and workshops, discussion group, and people mourning the loss of a loved one. “This powerful book draws us into the natural and supernatural dynamics of grieving, mourning, and suffering that find meaning when united to the grace of Christ’s victory over suffering and death. Highly recommended to all, but especially for support groups dealing with those suffering or struggling to find a path through the pain.” Eduardo J. Echeverria, Ph.D., S.T.L., Professor of Systematic Theology, Graduate School of Theology, Sacred Heart Major Seminary, Archdiocese of Detroit. ISBN 978-1-943901-10-4 from Lectio Publishing and booksellers everywhere. In Resurrection Power! Spiritual Solutions for an Anxious Age, Robert Garrity seeks to represent timeless truths from philosophy, theology, psychology and law to introduce readers to the idea of leading victorious, joyful lives, even in these anxious times. He offers a spiritual guide that is as practical as it is life-changing, organizing his discussion around empowerment over daily struggles and joyful acceptance of what cannot be overcome. In this newly released second—digital only—edition, the author challenges us once again to delve more deeply into the subject through supplemental material…The Resurrection: Truth or Deception? Here Fr. Garrity explores a unique approach to find proof of the Resurrection of Jesus Christ. He explores “is God real?” through examining the historicity of the evidence—truth or deception?—through a “mock trial” narrative with St. Paul on the stand in order to bring out the facts in the “case” followed by a hypothetical “verdict of truth” that Jesus rose from the dead. Finally, Garrity offers an analysis of the Bible’s narrative tradition along with an hour-by-hour timeline of the first Easter Sunday. Saint Teresa of Calcutta’s mystical awareness of Christ in the poor not only transformed her own life, but the lives of millions of people throughout the world, Christians and non-Christians alike, awakening a deeper appreciation of the inherent dignity of every human being. 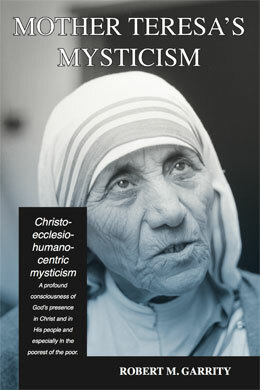 Mother Teresa’s Mysticism by Robert M. Garrity (Lectio Publishing, May 2017) specifically explores what is yet to be learned from her experience, theory, and praxis—particularly through the lens of her mysticism—and suggests that theologically it must be affirmed to be fully consistent with, and expansive of, the Church’s spiritual tradition. Father Robert M. Garrity, Assistant Professor of Theology Education at Ave Maria University dives into Christ’s private revelations (Eph 3:3-9) to Teresa, aside from her extraordinary vision or locutions, and labels her experiences as Christo-ecclesio-humano-centric mysticism: a profound consciousness of God’s presence in Christ and in His people, and especially in the poorest of the poor. Teresa discovered and loved Christ through extensive periods of darkness of the soul and in service to the poorest of the poor. Her life and her example uncovers for us all a new place for “doing theology” in today’s world. The book argues that Teresa’s mystical knowledge of Christ in the poor is distinctive, not because no one else has identified Christ in the poor (e.g. St. Elizabeth of Hungary and St. Vincent de Paul), but that Mother Teresa’s mysticism colors her entire worldview and her theology-in-praxis in an unequaled and most observable way, thanks to the power and influence of today’s 21st Century media. consider whether Theresa’s thought in each area can influence contemporary theological reflection and pastoral practices. Robert M. Garrity, JCL, STD, is currently an Assistant Professor of Theology at Ave Maria University, Florida where he has served since 2004. He received his S.T.D. and J.C.L. from The Catholic University of America (Washington, DC) and his BA in English Literature from Aurora College. He is author of Resurrection Power: Toward a Spirituality of the Resurrection (Lectio Publishing 2016), and O Happy Fault: Personal Growth through Spiritual Progress (Paulist Press 1994). Fr. Garrity was ordained in 1981. El Salvador’s Archbishop Oscar Romero was assassinated while presiding at Mass in 1980. Three years earlier, Rutilio Grande, S.J., priest and friend of the Archbishop, was also murdered for the same offense—speaking out for the poor and vulnerable. Archbishop Paglia said at the beatification of Archbishop Romero: “It is impossible to know Romero without knowing Rutilio Grande.” Fr. Robert S. Pelton, C.S.C., Notre Dame, said about the book: Understanding more fully their relationship is the special strength and contribution of this book. I recommend this book as an essential part of the living tradition of prophetic leadership in the Latin American Church. Latinos in the Americas live their faith not as individual spiritual quests, but as communitarian pathways to God. Romero and Grande unveil how commitment transforms human weakness. This book inspires us to imitate everyday holiness of spiritual leaders not as isolated heroes, but as members of what Christians call the communion of saints. —Timothy Matovina, Professor of Theology, Co-Director, Institute for Latino Studies, University of Notre Dame. Years of research and personal interviews went into this insightful, inspiring book. Much more than biographical, this deeply moving examination of the faith journeys of two key figures in the history of the Church come alive as great leaders and pastors, but also as profoundly human men of faith who can be companions in our own spiritual journeys. —Roberto S. Goizueta, Margaret O’Brien Flatley Professor of Catholic Theology, Boston College. Dr. Ana María Pineda, R.S.M., is a member of the Institute of the Sisters of Mercy of the Americas, and a graduate of the Catholic Theological Union in Chicago (M.A.) and the Pontifical University of Salamanca, Spain (S.T.D.). Doctor Pineda was on the faculty at Catholic Theological Union in Chicago and served as Director of its Hispanic Ministry Program. She is a founding member of the prestigious Hispanic Theological Initiative that supports Latino doctoral theological graduate studies. She is currently Associate Professor of Religious Studies at Santa Clara University College of Arts and Sciences. A native of El Salvador, Ana María as an adolescent met personally with Archbishop Romero, and her family is related by marriage to Fr. Rutilio Grande. 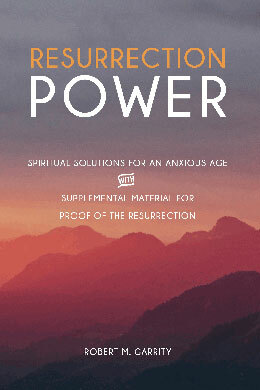 Our new spring book releases couldn’t be more diverse: a scholarly work that fills the gap in any study of evangelization, and an inspirational albeit practical solution to harness the power of the Resurrection. Evangelization: Building and Rebuilding the Kingdom: Issues of Language, Culture, and Conversion by Leon F. Strieder. Here Comes the CTSA Conference! Does Pope Francis Really Approve of Homosexuality? © 2013–19 Lectio Publishing, LLC. Most rights reserved.